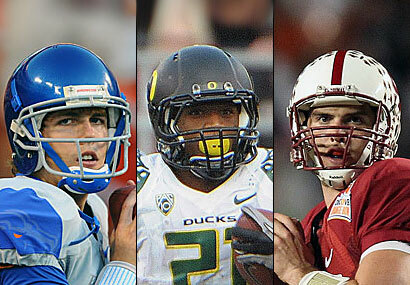 fanaddict: Who will win the Heisman trophy this year? Before the 2011 college football season starts, I'd like to take the time to compile a list of the players I think have the best chance of becoming the 77th Heisman trophy winner. #1. LaMichael James, Oregon: The junior enters this season with 3,277 career yards, 38 total TDs, and a 6.25 yards per carry average. James rushed for 1,731 yards and 21 TDs as a sophomore and will look to improve on his third-place Heisman finish and the Duck's National Championship berth last year. #2. Trent Richardson, Alabama: The Crimson Tide lost both McElroy and Ingram to the draft this year so it is likely that they will rely on a strong defense and a steady running game out the junior Richardson. Though he has been former Heisman Trophy Winner Mark Ingram's back-up for the past two seasons, the half-back has racked up over 1,451 yards with only 257 carries. There is even talk in Tuscaloosa that this back might be better than his predecessor. #3. Denard Robinson, Michigan: The Michigan Man is the ultimate dual threat at quarterback this year. "Shoelaces" has earned National fame from his elusive runs to losing his shoes. Dual-threat Quarterbacks have the highest chance of winning the Heisman, however he'll have to work on his passing if he wants to take the hardware. Unfortunately for Robinson, he plays for a mediocre Michigan Wolverines squad that is in the middle of a rebuilding stage. When you aren't surrounded by top-notch teammates with talent, it's hard to win. #4. Andrew Luck, Stanford: Though many say he is the best college football player in the country, Andrew Luck lost one of the best offensive head coaches when Jim Harbaugh left for the San Francisco 49ers. Luck has only one proven wide receiver in Chris Owusu and will need more than his 3,338 yards passing last season if he wants to win the Heisman. Luck will also have to beat Oregon to prove he is the best in the west. #5. Kellen Moore, Boise State: The Boise State Broncos have one of the nations best quarterbacks in Kellen Moore. He passed for 3,845 yards and had a 71.3% completion rate last season, partly because he played in the WAC. However, this year Boise will play Georgia and TCU, which allows them to earn a BCS Bowl berth if they finish undefeated. If Moore can lead the Broncos to the a Championship, he'll have proved himself worthy of a Heisman label.